America's original equine electrolyte. 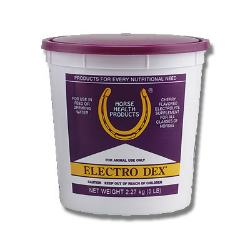 Supplies the electrolytes active horses may lose in training or competition. Cherry-flavored micro-blend for use in feed or drinking water. May be administered in the horse’s feed or drinking water at the rate of 2 ounces per 10 gallons of fresh water, or 2 ounces in the horse’s daily feed ration in place of regular salt. Important: When administered in water, allow no other source of drinking water.